Marvel released a new featurette for Ant-Man and the Wasp, which takes fans behind-the-scenes and sheds light on Janet van Dyne's motivations, while Marvel Studios boss Kevin Feige also reveals that the sequel "connects directly to Avengers 4." There has been much speculation about if and how Ant-Man 2 will relate to the final movie of Phase 3 of the Marvel Cinematic Universe. Additionally, the featurette shows more of the Quantum Realm than we've seen at this point. Kevin Feige starts off the Ant-Man 2 featurette by sharing his excitement that they finally have the Wasp in the MCU, pointing out that she's on the cover of the very first Avengers comic book. Feige then says that they now have had every hero from that iconic cover represented in the MCU. Additionally, we learn that Evangeline Lilly's Hope van Dyne has waited and trained her whole life to follow in the footsteps of her parents. Paul Rudd says that Hope is the power behind Ant-Man 2, which has been shown in previous pieces of promotional material. Perhaps the most exciting part of the Ant-Man 2 featurette is the fact that it shows off a lot more of the Quantum Realm than we've seen before. Scott Lang thinks that he spotted Janet van Dyne, which leads to Hank Pym developing technology to safely search for her. While all of this is going down on the screen, Kevin Feige chimes in to say that the sequel is directly connected to Avengers 4, which pretty much guarantees that the Quantum Realm is going to play an even bigger role in the upcoming movie than previously thought. Ant-Man 2 takes place before the events of Infinity War, but it looks like it will also take place during the aforementioned movie as well. It has been rumored that some characters from the sequel will suffer as a result of Thanos gaining all of the Infinity Stones and snapping his fingers. It has also been heavily rumored that these losses will lead to the use of Hank Pym's technology being used in Avengers 4 to time travel and enter other dimensions in an effort to retrieve all of the Infinity Stones before Thanos. While we now know that Ant-Man 2 will be directly connected to Avengers 4, we still don't know how everything will go down, which is exciting or maddening, depending on your point of view. 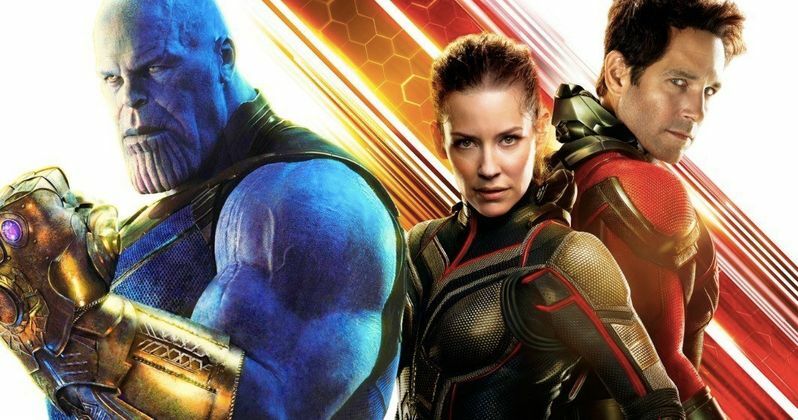 In addition to the aforementioned exciting news, Kevin Feige, Paul Rudd, and Evangeline Lilly all give interesting insight into the making of Ant-Man 2, with the focus on the Wasp and the Quantum Realm. And while the movie does look fun, as Lilly says, "the stakes are so high..." as we see Ghost slam Ant-Man into two walls before he finally stops. Ant-Man 2 opens in theaters on July 6th, but you can watch the brand-new behind-the-scenes featurette below, provided by the Marvel Entertainment YouTube channel.